Durek, one of the most powerful Shamans in the world, was in Turkey about 2 months. 15 years later after he lived in Turkey, this time he was here for a much more important purpose, besides healing people. Shaman Durek who left our country recently, expressed that Turkey has a very special position to change the world’s destiny and that Turkish people carry a power unique in the world hidden in their roots. Durek who travels all over the world is a bridge for healing such a wide community from Hollywood celebrities to royalty members, from family members to people who need help. 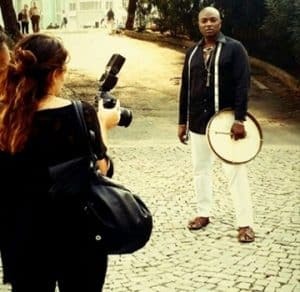 Shaman Durek was in contact with people at Bilgi Paylaşım Centre in Taksim; and with his own words the real purpose for him ’’being sent’’ here is to take out that unique spark from many people in Turkey as much as possible. Do you feel a strong connection to Turkey and it’s people? How did you decide to come to Turkey again? I am here, because God told me to come to Turkey. Something very big is happening here. A very big part of an energy that is going to change everything in the world has focused here. Turks want to live both like Europeans and without losing their side coming from the old world. This is a very powerful position. This is a spiritual revolution power. By taking a decision between two opposite energies you can change those energies in a unique way. “Shamanism is not a religion; it shows a way “ So, what is the key for the change in the society? In Turkey people don’t attempt to change something until it becomes so uncomfortable. It is easy to control people when they are stuck in a belief, based on fear and control. To cope with this, you have to turn back to your Shaman roots. You don’ t need to join Shaman rituals. You should head for your part that knows the truth, that nobody can put you in chain and scare you. Is returning back to Shamanic roots in contradiction with Islam? No it is not. Shamanism is not a religion. The way of a Shaman is restoring life with the things given by God and returning them back from the unbalanced, unharmonious damage that it’s in. We are preservers of life, animals and nature and the gifts of Gods love. We show the way but you are the one who does what is needed. What is the reason of this confusion in the Muslim world? There is an incredibly big and powerful love in Muslim culture. On the other side they feel like they are appearing weak and they feel attacked by the world this is why they are showing force. Death is not a show of force for God. Do you think that God is interested with what you wear, with How you cover yourself? God is interested if you are hurting consciously someone else or not and how you treat others. It is a big shame to assume that God will think like a human. Turks have this power to show the humankind this bond of loves principle. You have mentioned that the war between good and bad actualizes over Turkey. You are one of the main decision-makers, about what is going to happen in the future of this planet. That’s why darkness is trying to influence you and the Muslim world. You carry inside a beautiful code of the harmony if brought out through mindful thinking. Can have a huge effect over the world. You came to world to bring harmony. Of course only if you can get rid of your mistrust. Then you can become the most passionate, the most full of love human beings. And this can spread and lead to a great healing for everyone. Why does a person need shamanic session? People go to a Shaman when there is a blockage in the healing system and when they face problems with the health, family, mental and spiritual issues or to understand deeper wisdoms for your evolution. Shamans were the first scientists, first doctors and first therapists. How do you solve the health conditions? By speaking with the spirit of the person we learn the type of the problem. We understand if the patient wants to recover or not. They might be sick in order to make their spirit go through a transformation. Some people may not recover cause they might be willing their soul to become more mature for whatever the reason the choice is always up to the person. Some of them may learn from the illness and recover. I help them take that lesson. But I am not the healer. The person is the healer and God is always willing for them to be healed. The choice is up to them I am only the servant and messenger of God. All glory is of God. Are there any serious illnesses that you healed? There are people I have rescued from cancer and those who got out of coma and many others. Like I said you are the healer and God is always waiting on you to be open to its love. Why can’t we talk with our own spirit? You can talk but many people don’t want to hear what their soul says. The conflict occurs this way, you want to do it your way however your way is still missing information and can be harder as of God has a more simple and better plan for you. Because you are not used to it, not feeling it as your own opinion or idea, and you don’t agree with spirit so you block it and do what you want. What is the drum and the rattle doing in a session? The drum changes the frequencies of the brain. It enables the access to different energies and knowledge. The rattle disturbs the energy and agitates it. This is how all that comes from darkness is being disturbed. “You will listen to your feelings and heart” How can we hear the inner voice? First you will listen to your feelings and your heart beat. When you trust them you will start to hear a voice, and then you will communicate. People talk most of the time but they are not aware of it. Positive and inspirational things come from the soul. And the soul is connected to God. Negative things come from ‘’ darkness’’. What exactly is soul? Is it a conscious form of energy? Body is a carrier tool. Soul is a form of consciousness coming from God. Has free will. What is the difference between white and black Shaman? Black shaman is the one that is trained dark arts to protect people from bad spirits. They help people by dissolving darker energies. They pass trough a very intense training, they have to face bigger pains and cope with suffering. White shaman heals and helps people however don’t deal with spirits from the lower world. My role is in between both of them. Main Shamanic Turkish customs of your culture that I see people still use in daily life is? Knock on wood, Make a vow, pouring lead, evil eye beads, grave stones, pour water after a traveler, tie red ribbon to a woman after child birth, dome and the number 40 are the most common in the Anatolia customs of shamanism. “Stay connected to nature” What should we Turks do to get back to their Shaman roots? First of all they have to realize that they are not bad people and should stop thinking that they deserve to be punished. Your culture used in a wrong way a power that was given to it in the past by trying to become more powerful all over the world. Second thing is they should get rid of their jealousy. They should ask good things for each other. And finally stay in contact always with the nature and honor your body temple. Bring love into everything you do or say.